Note: A new GRASS GIS stable version has been released: GRASS GIS 7.6, available here. r.gwflow - Numerical calculation program for transient, confined and unconfined groundwater flow in two dimensions. Allocate a full quadratic linear equation system, default is a sparse linear equation system. Name of input raster map providing the leakage coefficient of the river bed in [1/s]. 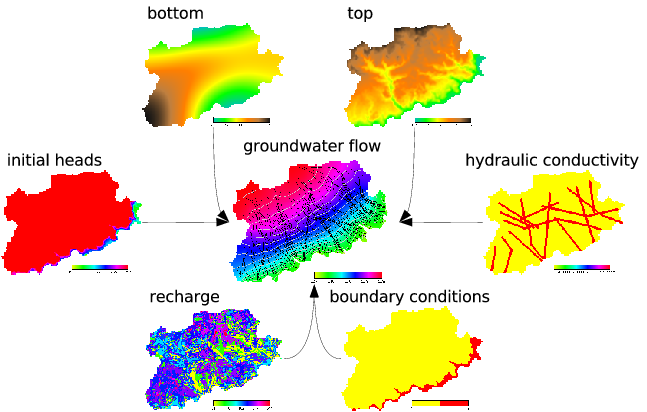 This numerical program calculates implicit transient, confined and unconfined groundwater flow in two dimensions based on raster maps and the current region settings. All initial and boundary conditions must be provided as raster maps. The unit in the location must be meters. This module is sensitive to mask settings. All cells which are outside the mask are ignored and handled as no flow boundaries. r.gwflow calculates the piezometric head and optionally the water budget and the filter velocity field, based on the hydraulic conductivity and the piezometric head. The vector components can be visualized with paraview if they are exported with r.out.vtk. The groundwater flow will always be calculated transient. For stady state computation set the timestep to a large number (billions of seconds) or set the storativity/ effective porosity raster map to zero. The water budget is calculated for each non inactive cell. The sum of the budget for each non inactive cell must be near zero. This is an indicator of the quality of the numerical result. Confined and unconfined groundwater flow is supported. Be aware that the storativity input parameter is handled differently in case of unconfined flow. Instead of the storativity, the effective porosity is expected. To compute unconfined groundwater flow, a simple Picard based linearization scheme is used to solve the resulting non-linear equation system. Note that all required raster maps are read into main memory. Additionally the linear equation system will be allocated, so the memory consumption of this module rapidely grow with the size of the input maps. The resulting linear equation system Ax = b can be solved with several solvers. An iterative solvers with sparse and quadratic matrices support is implemented. The conjugate gradients method with (pcg) and without (cg) precondition. Additionally a direct Cholesky solver is available. This direct solver only work with normal quadratic matrices, so be careful using them with large maps (maps of size 10.000 cells will need more than one gigabyte of RAM). Always prefer a sparse matrix solver. Use this small script to create a working groundwater flow area and data. Make sure you are not in a lat/lon projection. It includes drainage and river input as well. r.mapcalc expression="phead = if(row() == 1 , 50, 40)"
r.mapcalc expression="status = if(row() == 1 , 2, 1)"
r.mapcalc expression="well = if(row() == 20 && col() == 20 , -0.01, 0)"
r.mapcalc expression="river_bed = if(col() == 35 , 48, null())"
r.mapcalc expression="river_head = if(col() == 35 , 49, null())"
r.mapcalc expression="river_leak = if(col() == 35 , 0.0001, null())"
r.mapcalc expression="drain_bed = if(col() == 5 , 48, null())"
r.mapcalc expression="drain_leak = if(col() == 5 , 0.01, null())"
This work is based on the Diploma Thesis of Sören Gebbert available here at Technical University Berlin in Germany.